Best gifts to give back: Merry Christmas 2018! Christmas Time!!! Family, love and peace! We love it! From the singing to the parties, Christmas Season brings with it lots of joy. It is a season for giving, moments or gifts. Imagine if you choose a gift that give twice! Choosing a Christmas present should be a time to reflect and indulge. That is why we want to share with you our favourite finds for eco-conscious lovers, friends and family. Have a look at our list of the most stylish gifts to give back on this festive season. Why to buy: Ondina bag is inspired by the smooth shapes of the iconic Art Nouveau like furniture of Italian’s famous designer Carlo Mollino. Its perfect size fits all your belongings for a business day, a dinner invitation or a shopping day. This elegant bag is made of sustainable, vegetable tanned full grain cow leather from Tuscany and sparks summer feelings thanks to the striped interior cotton lining. It also offers flawless functionality: A zipped compartment for your wallet or Ipad, five card holders, two large pockets to store your essentials and a detachable cross body strap. The flap is beautifully hand stitched around the central eye and adorned with Lahara’s signature circle lock. What we love: Manufactured in a small family run workshop near Florence, it carries the signature of twelve passionate and skillful hands. Every piece is cut and assembled by hand, the edges are hand painted and every detail is refined with the greatest precision. It is a 100% Italian made product. Why to buy: The João-de-barro Wraparound Dress is made with organic cotton from Paraiba, Brazil and weaved in Spain. This unique latte colour isn’t dye, but the natural and real colour of a special cotton as you wash this dress, you’ll see the tan deepen. The contrast white colour is an extra soft white GOTS interlock is from Portugal. What we love: João-de-barro is a Brazilian bird that builds a remarkable hut-like nest to attract a companion and to start a family. Leticia Credidio’s wraparound dresses are based on ballerina training skirts. This super soft organic tunic recalls a long­-sleeved long-shirt and is crafted for comfort to allow free movement. The João-de-barro Wraparound Dress was designed in East London and handmade in a family run atelier based in Emilia Romagna, Italy. It is perfect for yoga lovers and for anyone who wants to make the most of weekends relaxing at home. This dress can be combined with the white Long Trousers made with an extremely soft GOTS jersey and based on legwarmers. 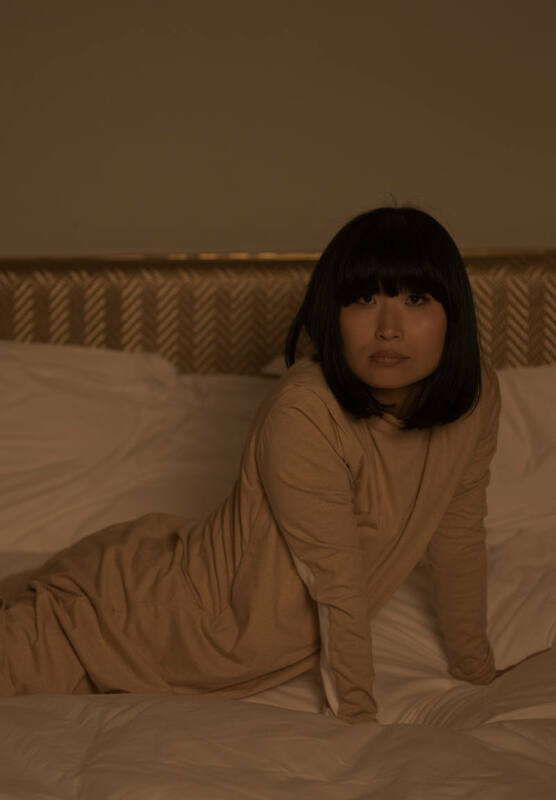 The idea is for you to sleep beautifully and wake boldly – Leticia Credidio’s brand is in a mission to unleash the power of sleep. 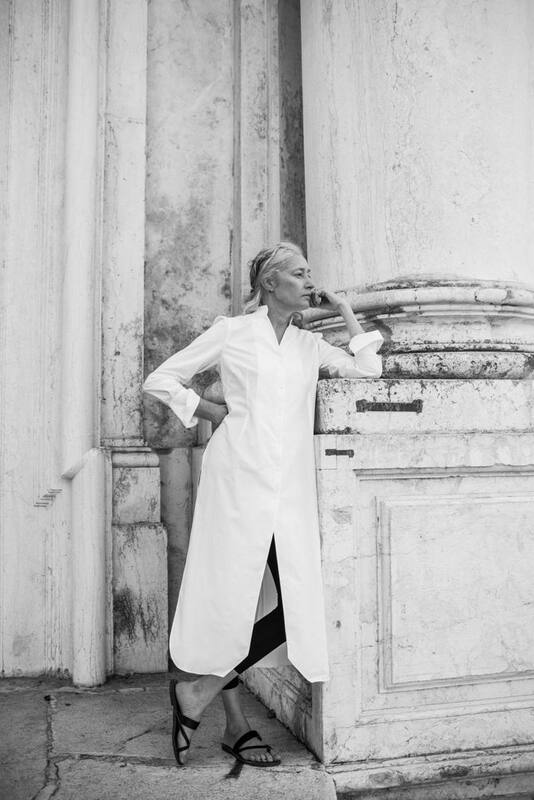 What we love: This elegant tunic, somewhere between dress and shirt, can be dressed up or down. Precisely placed high side slits allow you to easily reach your pants pockets for modern, practical style. Grammar explores the foundational elements of the conscientious wardrobe – starting with the classic white shirt. Upholding its iconic stature in the canon of style, the white shirt is versatile and smart – but, above all else, it is democratic. This translates to an inclusive approach to design, creating proportions with underlying ease and practicality that are fitting to women of all forms. Why to buy: Grammar is committed to working with the highest quality textiles and trims on the market, using natural materials. Grammar shirts are made in New York City using shell buttons and 100% organic cotton with GOTS certification, both recyclable and biodegradable. All production scraps are donated to FABSCRAP, a nonprofit that recycles textile waste. Grammar also believes in supporting local women and minority-owned businesses in New York City. By producing locally in small batches, they are able to minimize the impact of the supply chain and ensure that the highest quality standards are met on each and every garment. Why to buy: Totally in love. Designed by women for women, the accessory label F E R A L has designed a collection of 5 beautiful silhouettes with intentional details that will add elegance to everyday errands. No. 4, called the ‘Handsfree Phone Sling’ is one of the most versatile pieces in their collection. The practical details like zippered back wallet compartment and slip pocket for your phone eliminate the need to carry a larger bag. The versatility of the phone sling is almost endless. 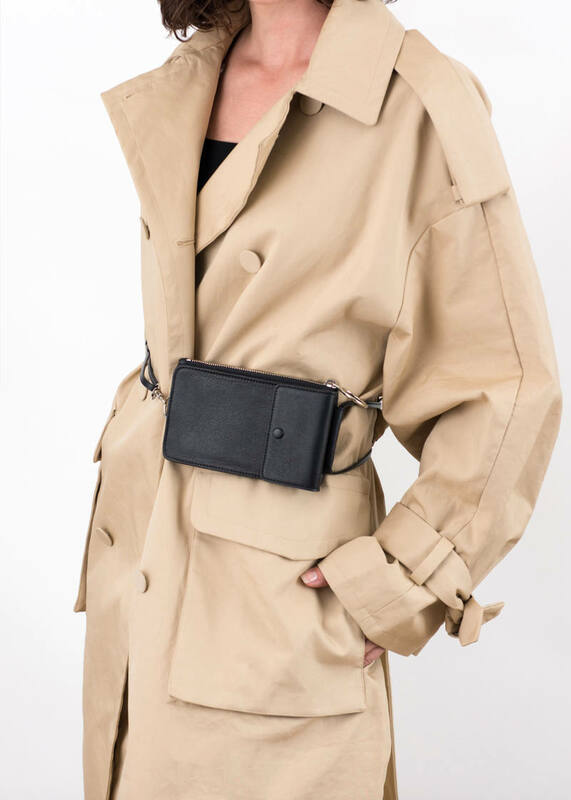 The adjustable strap allows it to be worn 3 ways -as a minimalist cross-body bag, as a necklace bag or as a chic belt bag-. What we love: F E R A L's sculptural and highly functional accessories are thoughtfully designed and grounded in premium craftsmanship. Ethically made from premium Italian Bio-Certified leather and sustainable components, each piece is made in small batches by skilled American artisans, in some of the same sample rooms as high-end designer labels. F E R A L is committed to their ethical ethos and a transparent manufacturing model, all without sacrificing an ounce of style. Investing in local communities is an important component of their American manufacturing model and they proudly donate a portion of every sale to charity. 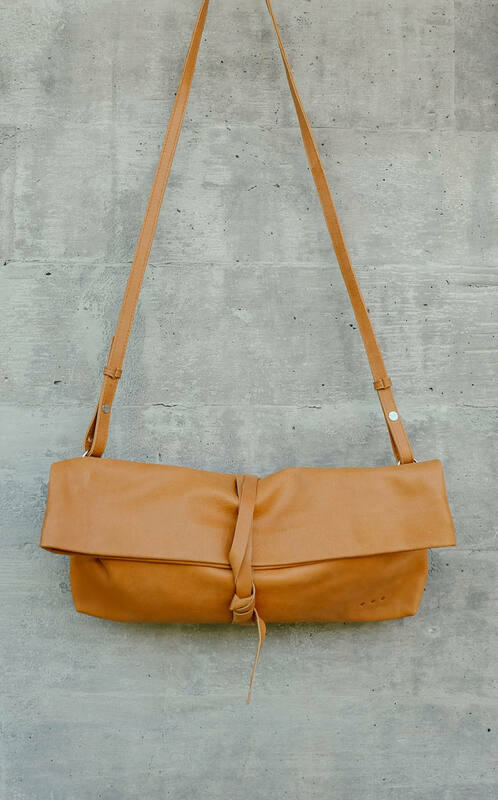 Why to buy: Kmana is a passionate, ethical, family-run design company producing leather travel bags and accessories in Bali. Each Kmana bag is unique, hand crafted and made to last decades if not a lifetime. Kmana uses vegetable-tanned leather and minimally processed chromed-tanned leather (for the exceptionally lightweight bags), both of which retain the natural characteristics of the hide. Every other element of Kmana bags, from the hardware to the lining, is hand-made, traceable and, to the maximum extent possible, ethically sourced. Kmana works with a number of workshops, small enterprises and cooperatives based mainly in Bali and Java, but also in other places in Asia, like Cambodia, and soon in East and West Africa. The company also believes in responsible profits and is committed to full transparency on its prices by offering a detailed breakdown of them. Besides, 5% of all profit is invested in a number of social projects aimed at empowering communities (especially women) and counterbalancing their carbon footprint. What we love: Inspired by Chatwin’s works and legacies and guided by the motto “less is more”, the Chatwin 7 clutch & cross bag marries functionality with a touch of eclecticsm and embraces clean and subtle detailing. The rang used for the inside lining is produced by the small cooperatives of women weavers of Nusa Penida. The bag is available in clack and towny brown. Why to buy: Fashion That’s Fair is the name of the first collection at Fabric For Freedom. Poverty and pollution are the reality behind the clothes we buy on the high street. They are new, they are fair, they are safe for everyone, created for positive change, designed with nature in mind. All their products are UK made in sustainable factories from the London area. Each of their suppliers are ethical and they can guarantee fair wages and good working conditions have been provided to make their garments. Organic cotton thread has been used on each garment. All items come in their unique recycled packaging and tissue paper and all labelling have been made from organic certified cotton. As a brand they partner with incredible, purpose-led charities which operate globally to create respect, value and to improve quality of living. These charities are passionate about eradicating poverty in working with and restoring those affected by human trafficking. What we love: The label has been built on a foundation of integrity, truth, transparency. Nothing is wasted, and it is celebrated with people, with fashion, with collaboration and with creativity. Designed for longevity - their ethos is to be responsible, honest and modern. Why to buy: Useful, comfortable and warm, this poncho is the perfect fit for all shapes and sizes. Also, it has been responsibly made in a small textile Workshop in Barcelona, using 100% organic sweat cotton. What we love: The Maroon poncho has been designed to complete your casual outfits. It fits great with tight trousers or a long plain skirt. It was designed in Switzerland and consciously handmade in Spain. The company always chooses sustainable materials and works with responsible processes because it believes fashion can be gentler on you and the planet. They produced this poncho using Global Organic Textile (GOTS) and sustainable materials which are environmentally friendly and free hazardous elements. The provider is a Textile agency certified by GOTS and specialized in organic fabrics. Why to buy: Written in English, German and Spanish, Luxiders Magazine Issue 1 represents an enhanced global resource for sustainable brands, creative professionals and consumers who want to improve and increase their knowledge about sustainability and connect with other sustainable creators. The magazine aspires to expand the responsible consumption worldwide, building a culture of respect, with positive effects on the economy, society and the environment by reducing poverty, hunger, pollution, climate change and inequalities and increasing well-being, justice and peace. Founded in Berlin in 2017, Luxiders Magazine began as a project of passion to fill the void for an informed, creative and avant-garde eco-friendly readers and consumers. After one oficial year online, the magazine has experienced an important growth through its collective attraction of “likes” and followers. Cutting-edge photographers, eco-conscious writers, compromised sustainable influencers... Luxiders Magazine count on a selected creative community who wants to make sustainability adorable. All of them want to be seen, in all formats. An add-on reason for the founders to launch the print magazine. 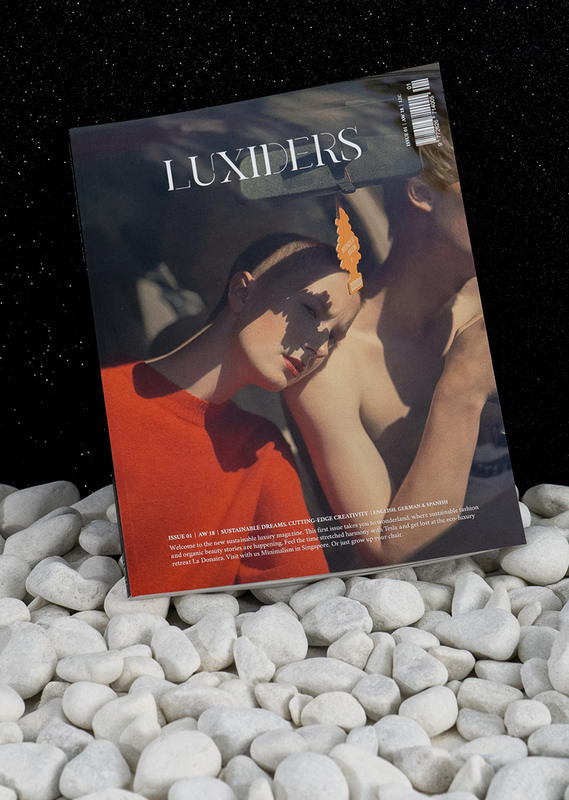 By buying this magazine you are investing in Luxiders Magazine Issue 2.